Bryan’s House integrates on-site nursing with high-quality education and developmental care geared to each child’s needs. 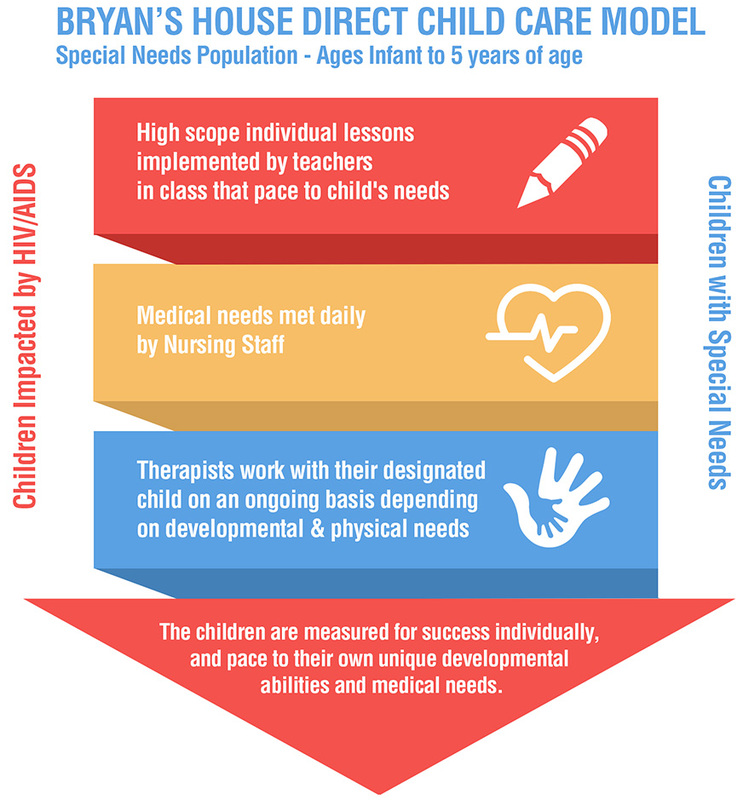 Nurses, supervisors, teachers and caregivers collaborate to provide medical care and perform developmental assessments that blend into thechild’s daily activities of each child. As needed, we also coordinate for licensed therapeutic care. This is our largest program, serving children ages 0-5 who cannot be placed in regular child care programs. (They may have fragile immune systems or need intensive nursing or specially trained caregivers.) Our program, which assesses their developmental strengths and needs and recommends activities that will build on their strengths and meet their needs, is accredited by the National Association for the Education of Young Children (NAEYC). We use the acclaimed HighScope curriculum to create individuated development plans. Hours Monday-Friday, 6am-7pm. On weekends Bryan’s House lets parents and caregivers to take a break from caring for a special needs child by providing a safe and fun environment for the child with other children. Two Saturdays per month from 8am-4pm. Summer program 11 weeks. Respite care is important for parents and the child. Parents of special needs children often struggle to find time to take care of their own business and personal needs or just get some relaxing time off from care-giving. And the child who is cared for at home and sees mainly the same caregiver can become isolated and friendless. For parents whose work day doesn’t end when school does, we offer care afterschool and during summer and holidays in a safe and nurturing environment. Children participate in learning, developmental, and recreational activities according to their abilities. Our care enables them to retain cognitive and developmental advances made during the school year. Questions about our Direct Care programs? Click to e-mail Shannon Hendricks or call her at 214-559-3946, ext 128.